This is the perfect breakfast for you and your honey on a beautiful spring morning. 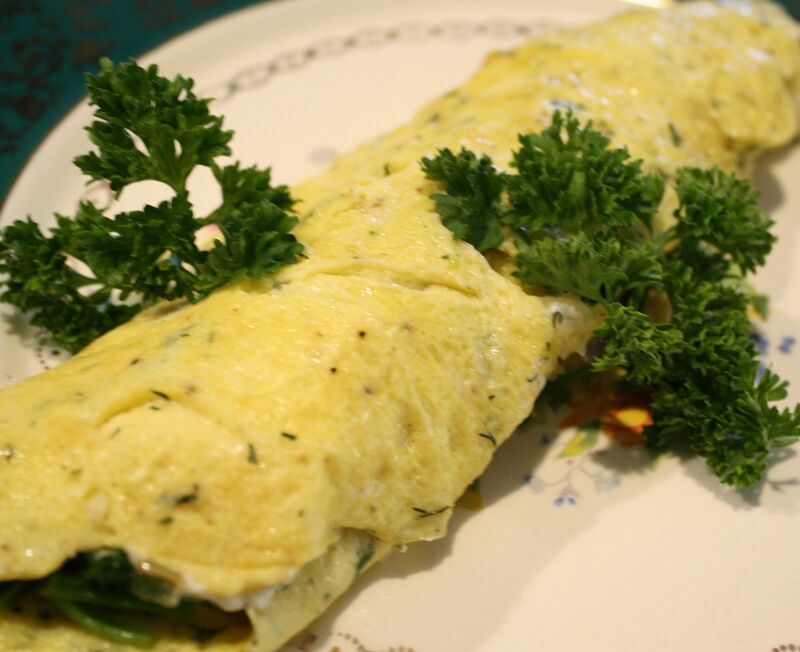 I’m not going to tell a lie, I served this beautiful omelette to my hubby in bed this morning! It’s simple, full of flavor and just the right amount of protein, iron and nutrients to get the day started right. Using a Teflon pan, sauté onion in butter till soft, then add spinach and cover till spinach is wilted. Remove from pan and set aside. In a bowl, scramble your eggs with the half and half. Add your salt and pepper and mix until your eggs become frothy and light. Next heat your pan to medium and add your eggs. Cook low and slow scrambling a little in the pan by moving your spatula around. Move the eggs away from the side of the skillet until eggs become fluffy. Add your spinach and onion mixture down the center of the skillet then add your goat cheese in the same way. Fold the eggs from the edges to cover the center. Remove from heat and cover with a lid for three minutes, (this will give the goat cheese time to soften. Add to your plate, garnish with parsley, eat and enjoy.